Beautifully engraved certificate from the Aguas De Barcelona issued in 1962. This historic document has an ornate border around it with a vignette of an alegorical woman sitting, pouring water out of a vase. 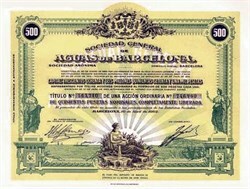 This item shows the signatures of the Company’s Presidente and Consejero and is over 39 years old. Sociedad General de Aguas de Barcelona (Agbar), provides water and wastewater services to nearly 13.6 million customers (about 35 million people), mostly in Spain and Latin America. Agbar's other primary areas of operation are solid-waste collection and treatment, and health care and insurance services. Other activities include vehicle inspections, tax collection, engineering and constructing, facilities maintenance, and offering e-commerce and corporate supply and logistics services. Agbar also has projects in North Africa and the Americas. The company is 48%-owned by HISISA, a subsidiary of Suez.